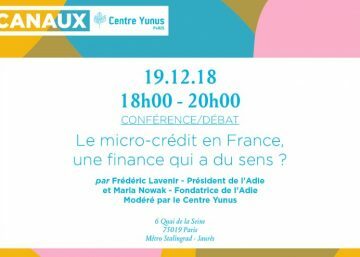 For their first public event on November 28th, 2018, Centre Yunus and Les Canaux organized a screening and debate around Amirul Arham documentary, Social Business. During two years, the director followed Nobel Peace Laureate Muhammad Yunus and filmed his projects in the field, chasing this question at the heart of his work: how can we eliminate poverty? 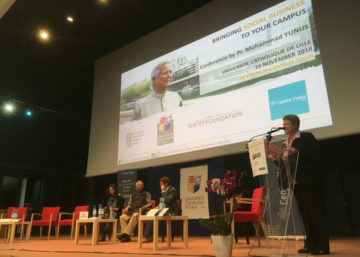 The documentary shows the mechanisms of social business, from small to international companies, notably through Grameen Veolia experience in Bangladesh. 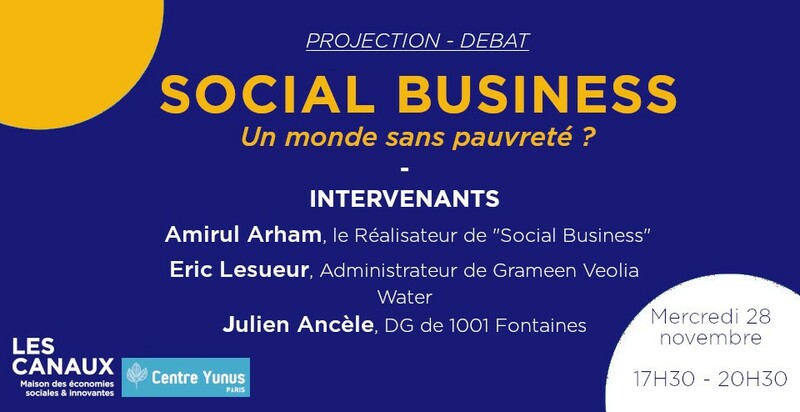 The screening was followed by a debate in presence of the director and two social business & water experts: Eric Lesueur, 2EI Veolia CEO and Grameen Veolia administrator, and Julien Ancèle, executive director of 1001 Fontaines, an NGO active in Cambodia and Madagascar. “Nowadays, 2 to 3 billion people worldwide do not have access to drinkable water”, estimated Julien Ancèle. The solution brought by 1001 Fontaines aims at easing its access at better price. It allows creating micro water treatment factories: 20 liter bottles are sold at 1 cent per litre. Today, about 500 000 people beneficiate from it. Founded in 2008, the social business created in partnership with Pr. Yunus, Grameen Veolia Water, “is slowly reaching breakeven, having to face high infrastructure costs”, reported Eric Lesueur. The company also aims at bringing safe water to as many people as possible, mitigating the risks of illness linked to groundwater arsenic contamination. 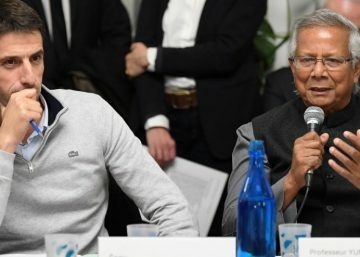 30/01/2019 07/02/2019 [Impact 2024] Professor Yunus co-leads the platform first strategic committee meeting.